MGM Grand Resort Hotel and Casino in Las Vegas, Nevada has a 170,000 square foot casino gambling floor with 2,400 slot machines, 195 table games, race and sport book, poker and Hotel with spa. 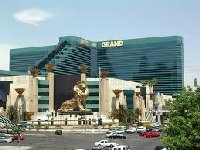 The MGM Grand is one of the largest hotels in the world. When you visit make sure you take a slow walk through the casino and see the sites. This is one of the more popular casinos on the strip and defiantly worth a visit. The monorail going to the Las Vegas Convention center begins here. Table games: 195 tables playing all the popular games. Poker: Large private 22 table poker room playing a variety of games. Sportsbook: MGM Grand's Race & Sports Book is a state-of-the-art 5,300-square-foot betting arena, located near the action of the high-energy Studio 54. This is the largest hotel in the world. 5,005 Standard rooms starting at $79, 752 suites starting at $169, and 51 sky lofts starting at $800. As you can see the pool area is phenomenal, it is like swimming in the jungle. MGM Spa has everything from luxurious facials and nail services to soothing massages and body wraps, the thirty treatment rooms along with saunas, whirlpools and lounges provide a multitude of ways to unwind and revitalize. 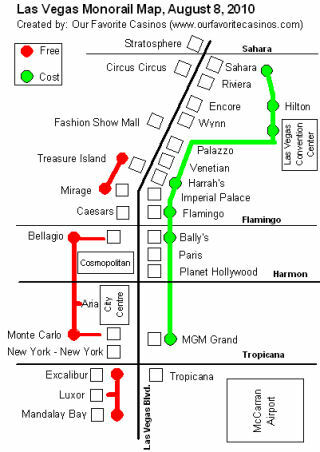 MGM is the last stop on the Mono-rail that goes to the Convention Center.